Twice a year the CBTRC hold a research day to allow researchers to showcase their current work with other members of the team. The CBTRC Autumn event took place in the Nottingham University main campus pharmacy building on the 18th October 2018. This year the themes of the day included Molecular Neuro-Oncology, Drug delivery, Brain injury and Bioinformatics. We invited two guest speakers for the research day, Alan McIntyre, Assistant Professor of Cancer Biology, who focused on targeting the tumour hypoxic response as an anticancer therapy for hypoxic tumours. 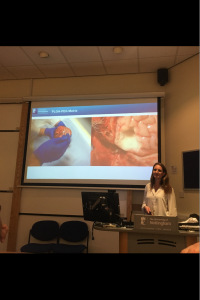 The second invited speaker was University Academic Fellow, Lucy Stead from the University of Leeds, whose work focuses on investigating intratumour heterogeneity in Glioblastoma. In between the two invited speakers we concentrated on presentations from numerous PhD students, Post-docs and technicians from the CBTRC. Each presenter had 20 minutes to present their research followed by a question and answer session from the audience. The large range of topics, such as modelling medulloblastoma in 3D, sprayable drug delivery systems and targeting the immune system in relapsed ependymoma (plus many many more) created a very interactive atmosphere for discussion. We also had different chairs for each theme which gave additional helpful comments for each presenter. 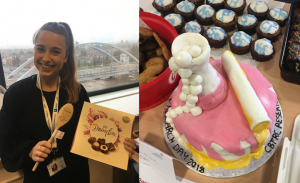 Aside from the interesting academic programme, the organising committee also arranged a science themed bake-off to bring out everyone’s inner Mary Berry! Fantastic cakes ranging from lab coats and periodic tables to beautiful butterfly gardens were submitted and expertly judged according to aesthetics and taste by all attendees. The star-baker of the day was the first year PhD student Louisa Taylor with her ‘Messy Lab Top Bench cake’. The judges loved her attention to detail and her delicious tasting cake!